You know that popular meme of a carefree Peter Griffin luxuriating on a dolphin with the caption that says, “how I feel after I shaved everything, moisturized myself, and washed my hair?” That’s totally me, only I’d add one other point: “how I look after using a good body scrub.” In my opinion, one of the best luxuries in life is having velvety, clean skin. I always feel so glorious once I’ve gotten all the dead skin off my body with a mighty scrub and slathered myself in my favorite body lotion or oil. To me, that’s the pinnacle of self-care: looking after my skin. As someone who is prone to getting acne from my face down, pampering myself and taking good care of my body — both internally and externally — is of utmost importance in my life. That’s how I keep pimples at bay. Plus, it consistently boosts my mood. If I let my body care regimen fall by the wayside, you best believe I’ll start breaking out in the most annoying places, like my inner thighs. So, to remedy this, I exfoliate my body twice a week. It’s a rule I’ve stuck by for as long as I’ve had a skincare routine. As you can imagine, I’m always looking for new scrubs to try out. 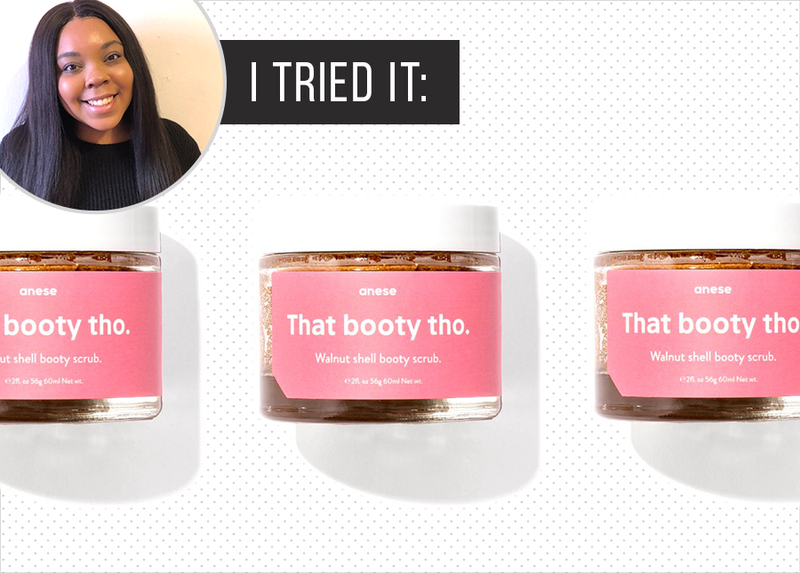 One in particular that I’ve been seeing all over my Instagram feed is the Anese That Booty Tho — The Original Booty Scrub body scrub ($28). (I mean, that tongue-in-cheek name? Whoever came up with it seriously needs a raise.) Although I’m not usually one to fall for Instagram ads, the ones from Anese totally got to me. Made from a blend of walnut shell and sweet almond oil, the formula is said to combat acne and reduce the appearance of stretch marks, cellulite, scars, and discoloration while leaving your derriere (and the rest of your body, too) silky smooth to touch. While I don’t believe topical products have much power in diminishing the visibility of cellulite, the other benefits seemed really appealing. So I went ahead and gave it a test run. On the glass, it says to take two fingers full of the product, mix it with water, and rub it on your skin in circular motions, so that’s what I did all over my body. Unlike some other scrubs I’ve tried in the past, this was incredibly gentle to use, which I really appreciated. I love the after effects of a good exfoliation session, but I don’t want to feel like I’m torturing myself while I’m at it, which is how I feel whenever I’m using abrasive formulas. This was the complete opposite. And even though the texture of it was super fine, it did an incredible job at getting rid of dead skin. After dousing myself in water to wash everything off, I noticed that my body had a visible glow to it, and my skin felt really soft. So much so that I couldn’t stop touching my legs and arms after getting out of the shower. I was really impressed. That’s not to say there weren’t downsides to this scrub. Unless you’re a fan of really earthy scents, you may find the smell a bit off-putting. Thankfully, it doesn’t linger on the skin, so it wasn’t too much of a problem for me. It also didn’t really make a difference in reducing how visible my stretch marks were. Then again, I would probably have to use it more before seeing any results, and to be completely honest, I’ve never found a topical treatment that changed how they looked anyway. I just have to let them fade with time. On the price front, it would be a little costly to repurchase That Booty Tho frequently if you’re a big lover of body scrubs like I am. In fact, I’ve used my current jar three times so far, and I’ve already finished a third of it, so I’ll probably have to get a new one next month. However, I do think it’s a worthy investment. My skin felt and looked firmer each time I used it, and it does a great job at exfoliating without being harsh. In turn, it’s now a part of my regular skin care rotation. The Financial Confessions: "My Mom Stole My Identity To Keep Our Family Afloat"